Root Consulting has been delivering cabling system for more than 15 years. We provide cabling solutions using Fiber Optic Cabling, CAT 6, Cabling, CAT 5e Cabling, CAT 5 Cabling, CAT 3 Cabling, 25 Pair or 50 Pair Plenum or non Plenum Cabling. Any System that is delivered will be tested and certified with Fluke Level III Tester, and results will be provided. All of our cabling technicians are OSHA certified and TWIC certified so that your security and cabling system is delivered by Certified background checked Technicians. Our project managers can work with your architect and we provide as-built drawing upon request. For those clients that are considering a relocation to a facility that is currently cabled and you are considering reusing it, have Root Consulting’s Certified Technicians test and verify the cable for you before you move to assure everything is working, labeled correctly, and up to current standards. A well designed plan for your cabling will go a long way in making sure you will be able to conduct Business. If you are a victim of poor cabling, please contact Root to help your repair and salvage your existing cabling system, and we will give you a professional analysis of where the past installers may have made mistakes. Remember your Network is only as strong and fast as the Structured Cable Backbone that supports it, put in the right system now and you will enjoy a low maintenance system that can work for years. Root can provide up to a 25 year manufactures warranty on qualifying systems. Please ask your sales person for information. Root supports the greater Chicago area from unincorporated Hinsdale. Our Illinois office is located in Du Page on the border of Burr Ridge and Willowbrook with I-55 access. We can be almost anywhere in Chicago in under an hour that includes cabling in King, Will County and Cook County; helping with our emergency response service. Root Supports the greater Houston area from our office on Durham. Our Texas office is located in Harris County inside the North loop minutes away from the north 610 loop or I-10. The location is ideal for servicing Houston, Clearlake, Spring, the Woodlands, Katy, Sugarland, and Galveston. CALL US TODAY AT 1-866-279-ROOT! Randall Industries has had Scott Taylor install Allworx systems in three of our locations with plans in the works for a fourth. Outside of my company I hired Root to install the same system at my church and grade school. He is the most conscientious contractor I have had to privilege to work with in my 22 years in the IT field. He is reliable, neat, orderly, organized and makes himself easily available for support. A good example – several months ago, we had a piece of equipment unrelated to the phone system fail and he was here at 5:30 in the morning with a replacement of his own that he let me use until we had a permanent replacement in place. If there is anyone I can count on in a pinch, it is Scott Taylor and his company Root Consulting. I installed the Allworx system in our Houston, Chicago & Lombard office. I believe that this system is the best option we had. In terms of “ease of use” the menus are very straight forward. Navigation through the processes of adding extensions, phones and users is very intuitive. From an IT perspective, the installation was very easy. The communication with the team from Root was spot on and Scott has a good handle on what is needed to get done. 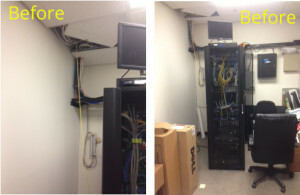 Root also handled the cabling for all three locations and was extremely professional and clean in their efforts. I would recommend this unit and company again for my next office. Scott Taylor and his team were extremely helpful to us as we moved into new office space about two years ago. Scott was very patient as we learned the process and worked with us on everything from planning to purchasing and installation. Root Consulting was highly professional, able to manage the install on a tight timeframe and worked with us every step of the way to ensure we had the right equipment and everything was in good working order. Scott and his team remain working with us today with their managed IT services and ongoing support for phone and data systems. He offers us piece of mind and value as he works hard to make sure we are always up and running smoothly. Hope your move goes smoothly and believe you’ll be in good hands with Scott and his team. © 1999-2015, Root Consulting, Inc. All Rights Reserved.